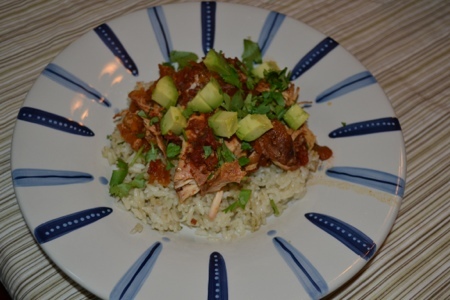 I threw this in the crockpot last week… Sounded pretty good…. It came out ok. Nothing super great! The thyme in the rice really overpowered everything. Wonder what it would have tasted without it? Put onion, celery and carrots in bottom of slow cooker. Season chicken with salt and pepper and arrange over vegetables. In a medium bowl, whisk together tomatoes, lime juice, and spices, and garlic. Pour mixture over chicken. Cover and cook on low for 6 to 8 hours or high for 3 to 4 hours. Serve topped with diced avocado and cilantro and garnished with lime wedges. In a medium saucepan, combine rice, coconut milk, water, thyme, and lime zest. Place pan over high heat and bring to a simmer. Reduce heat to low, cover and simmer 20 minutes, until liquid is absorbed. Fold in scallions and season to taste with salt and pepper. My mother in law flew in last night to stay with us for a few days…. Since I had to pick her up at the airport and the munchkin had ballet it was a perfect day to throw chicken in the crock. This came out really good the sauce was really good! I didn’t boil the sauce but just mixed the cornstarch mixture right in the crock. I served with sushi rice and sautéed green beans. Place chicken in slow cooker. In a large bowl, combine the sugar, soy sauce, cider vinegar, ginger, garlic and pepper. Pour over chicken. Cover and cook on low for 4 to 5 hours or until chicken is tender. Remove chicken to a serving platter; keep warm. Skim fat from cooking liquid. Place liquid in a saucepan and bring to a boil. Combine cornstarch and water until smooth. Gradually stir into liquid and stir until sauce is thickend. Serve with chicken and rice. I took out chicken a few days ago with every intention of cooking up a storm. But, speaking of storms, the weather had another idea. Winds got up to 70mph here and knocked out our power. Since we didn’t know how long it would be out we opted to just go into town for dinner. Fast forward to today. So, here I am husbandless for the weekend (he is turkey hunting….the result of which will probably a 2-day beard, a bit of sunburn and a headache!) and not REALLY in the mood to cook but I have chicken about to spoil. I also have meyer lemons, mushrooms and spinach about to spoil. Sounds like picata time. I found a quick recipe on allrecipes.com. It, naturally, needed modifications because WHAT is picata without capers! The kids were watching Tom and Jerry, I whipped up dinner. They all sat down and STARED! I HATE going to any sort of effort just to have kids NOT eat. Push the spinach aside kids….just eat your damn dinner! After a few bites, spinach and capers picked out. Dinner was done. I think it was perfectly delicious. Hubby will like it (not as much as his mom’s but…) I will probably make it again because I typically have all the ingredients at any given time. I served it with spaghetti into which I juiced 1 lemon, added a dash of olive oil and grated some fresh parmesan cheese. In a shallow bowl, mix together flour, paprika, and salt and pepper. Dredge chicken pieces in the seasoned flour. Heat oil in a large skillet over medium heat, add garlic and saute chicken until light golden brown (about 45 seconds each side). Remove chicken from skillet, and set aside. To skillet, add mushrooms, lemon juice, and chicken stock. Simmer until a smooth, light sauce develops. Season with garlic powder. Return chicken to the skillet, and simmer until chicken is no longer pink and juices run clear. 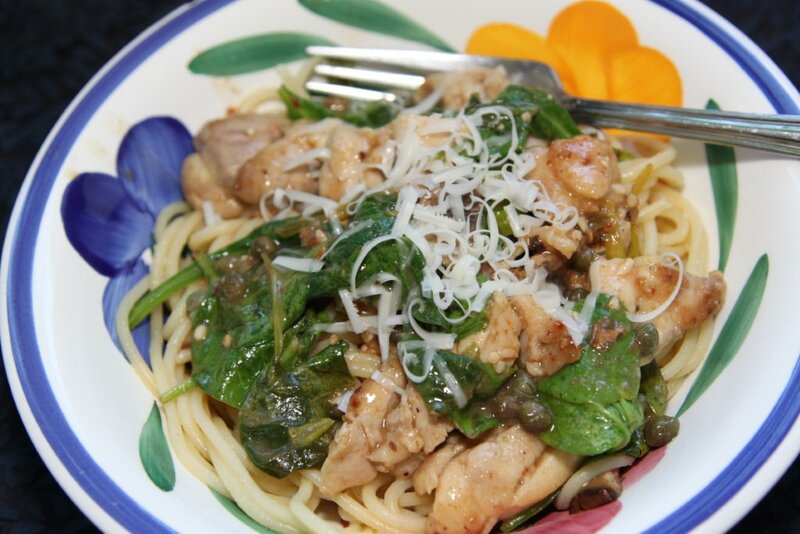 Stir in spinach and capers, and remove from heat. i had taken out 2 packages of chicken yesterday then remembered that we didnt need leftovers – so i only used one package – leaving me with a package of chicken i HAD to use today! 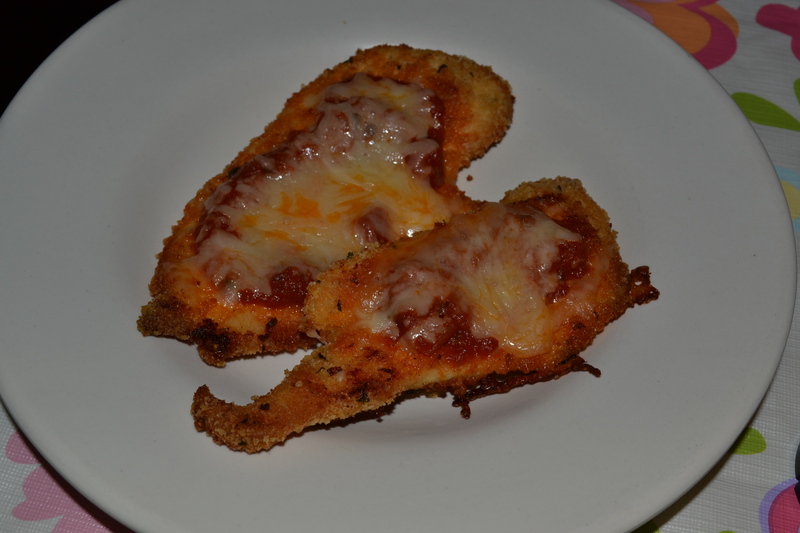 this chicken was YUMMY the kiddos gobbled it up and left one small piece for the husband… the kids ate it with a side of peas – the husband had some leftover pizza alongside his chicken 🙂 i’ll definitely make it again but use double the chicken! Preheat oven to 450°. Line baking sheet with parchment paper and spray lightly with spray. Lightly spray a little more cooking oil on top and bake in the oven for 20 minutes.Turn chicken over, bake another 5 minutes. Remove from oven, spoon sauce over chicken and top with shredded cheese. Bake 5 more minutes or until cheese is melted. Combine beans, onion, corn, tomato sauce, cumin, chili powder and taco seasoning in a slow cooker. Place chicken on top and cover. Cook on low for 10 hours or on high for 6 hours. Half hour before serving, remove chicken and shred. Return chicken to slow cooker and stir in. Top with fresh cilantro. 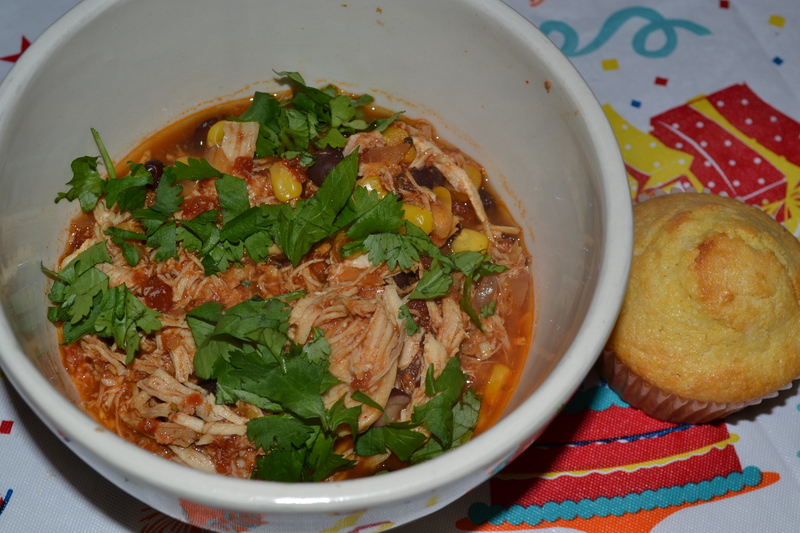 sometimes crockpot meals turn out awesome – sometimes they’re just ok – and sometimes they’re terrible.. this one turned out terrible for me! partly it was my fault. chicken breasts on low for 10 hours just dont bode well… i should have put frozen breasts in.. and i used tamari instead of low sodium soy sauce.. dont ask why — so the whole thing was overdone and REALLY salty! would it have been less salty with the soy sauce? who knows… id be willing to try this again – but with a much LESS cooking time! 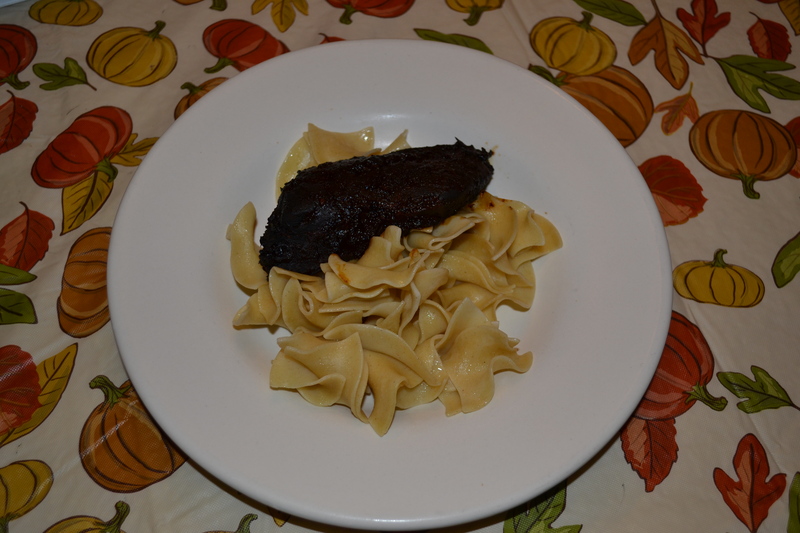 NOTE FROM BUMPKIN – I couldn’t bring myself to photograph this dinner. I made it with all the correct ingredients, including chicken thighs. I put them in frozen (tsk tsk) because I knew it would be all day before I would get home to “check” on the meal. 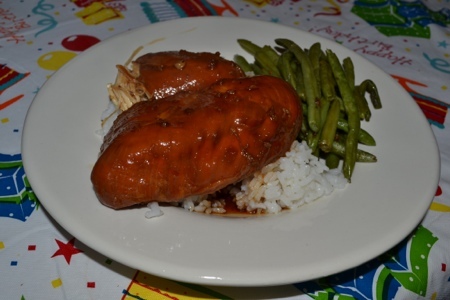 The skin from the chicken made the sauce really oily, which separeted from everything else. The chicken was fall-off-the-bone tender but everything was in slimy pieces. I served it over rice and where Townie’s photo looks like a piece of poop (LOL) next to noodles, mine looked like vomit on rice. The flavor was ok. I MIGHT make it again. But, more likely if I am going to just throw chicken in a crockpot I might just grab my “standby” ingredients and have it be less oily and less salty. Use a 4-quart slow cooker (if using a 6-quart, this will cook faster. Check after 3 hours on high, 5 hours on low). Put the chicken into your cooker. In a small bowl, combine the rest of the ingredients, then pour evenly over the top. Cook on low for 6 hours or high for 3-4 (I’d go with low—). Serve with basmati rice and steamed or roasted vegetables.